My 2000 Chevy suburban has been completely reliable. I have had it for approximately 2 years, purchase from previous owners. I have only had to make some minor repairs to it. Seats 7 people comfortably with space in the back for shopping or travel luggage. One problem that seems to be recurring for this auto is the brake system lights come on, and sometimes one headlight goes out (I have seen this happen in quite a few of the older models). Other than that, this truck has been perfect. The most important thing others should know about my car is that I am self sufficient and Independent. I like this vehicle because it has enough room to haul as much or as little as I want. I like that it is heavy duty and has a 3/4 weight. I like the engine size is very strong to haul around the weight of the vehicle. I also like that when I drive it people get out of my way and do not try to ride my bumper. However I do not like the poor gas mileage and the very expensive fill up. 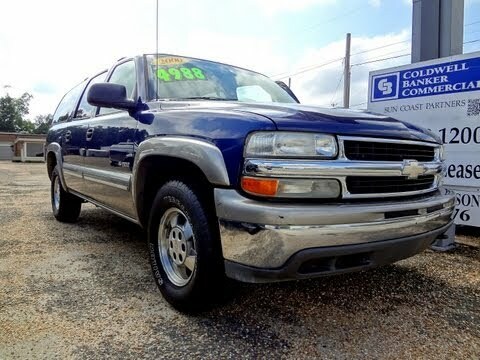 This suburban has been driven hard but is still going strong. I really like that our suburban can fit so many people. We have nine seats in the vehicle. It also has a huge cargo area that we use when traveling or for groceries. It is an older vehicle, so that makes it easier for my husband to work on himself, which saves us money. It rides well, is easy to handle, and is dependable. Certain light duty pickup trucks and sport utility vehicles have a clearance between the front right-hand brake pipe and the body cross sill that could decrease to the point of allowing contact. If contact occurs and the brake pipe becomes damaged, there can be a loss of brake fluid and pressure. The brake warning lamp will be activated when the brake fluid lever reaches the indicator limit. During braking, the pedal will be lower than normal and stopping distances will be longer. If this occurs when stopping distance is limited, a crash could occur. Dealers will inspect the front right-hand brake pipe for wear. If there are signs of wear, this section of the brake pipe will be replaced with a new designed brake pipe section. If there are no signs of wear on the brake pipe, the dealer will install a spacer clip to ensure sufficient clearance between the brake pipe and the body cross sill. The manufacturer has reported that owner notification was expected to begin during December 2000. Owners who do not receive the free remedy within a reasonable time should contact Chevrolet at 1-800-222-1020 or GMC at 1-800-462-8782.